Having to take a penalty kick is arguably one of the most stressful and pressured moments for a soccer player during a game. 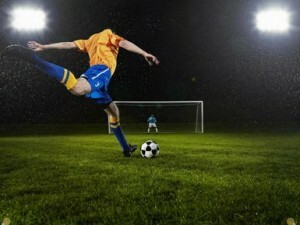 The reason is because a penalty kick is a psychological game along with being a physical achievement. There are various important elements that need to be understood and kept in mind when shooting a penalty. The player would need to avoid showing overconfidence but should know his/her strengths and tactics. The player should also focus on not giving away any intended movements with the body and the eyes. The penalty kick and regular soccer kick from the penalty mark might be similar, these two are different and have distinct rules. The penalty kick occurs during the match. It follows the Penalty Kick Law 14. This dictates that the free kick need to be done about 12 years or 11 meters away from the goal post and only the goalkeeper of the opposing team would be between the penalty shooter and the goal post. These types of kicks are made at the completion of a game during a tournament. This is different from a penalty kick in the sense that it is a method used to determine which team would be going forward to the next stage of specific tournament being played. This type of kick takes place at the end of a game where both teams have scored draws. The procedure is similar to the penalty kick but this type of kick does not follow the Penalty Kick Law 14 but it is mentioned in other sections to the Laws. This penalty shootout is commonly known as “penalties”.